Jett, by Talbot Hopkins, a photo by trudeau on Flickr. BAC's Gallery Fine Art Center presents a realist exhibition featuring the art of Jerry Berg, Daniel Cassity, Albino Hinojosa , Talbot Hopkins and Peter Jones, says Leigh Anne Chambers. 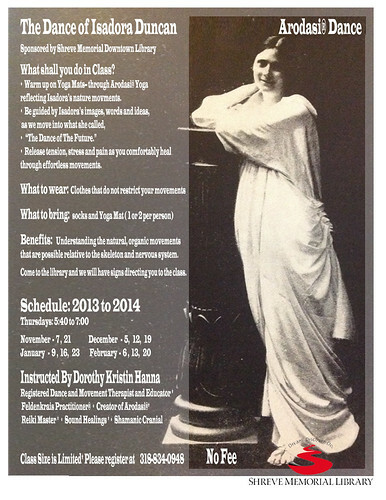 The show will be open on Nov 2- Feb1, with an opening reception on Th, Nov 7, from 5:30-7:30. The exhibition is open to the public and free of charge. Gallery hours are Thursday-Friday, from 2-6pm and Saturdays, from 11-2pm. The Gallery Fine Art Center, a Bossier Arts project, appreciates donations by Meredith Hamrick, Sharon and Ken McGivney, Marcy Everett and The Airline Plaza. Highland Art tour, a photo by trudeau on Flickr. Thanks to Liz Swaine for organization work in the Highland Cultural Arts District. Cuban art, Artspace Shreveport, a photo by trudeau on Flickr. Shreveport Opera sings and acts the Elixir of Love on Sat, Nov 9th, says Steve Aiken. Student tickets and TWEET seats only $15! Tickets begin at only $25! or by phone at (318) 227-9503. Shreveport Opera Xpress artists Leroy Davis, Daniel Bates and Cristina Bakhoum as well as local singers John Bogan, Philip Boswell, Heather Bryson, Nancy Carey, Betty Cummings, Nicholas DeMeo, Johanna Epley, Bill Gallmann, Howard Goode, Paul Hand, Samira Mazloom, Jerry McLarty, Christina Nehrling, Kimmie Perales, Cristina Pisani, Marcie Ratcliff, Stephanie Rhodes, David Sherman, Viki Sparks, Talicia Tarver, Harry Townsend, Leslie Townsend, and Monica Valencia. Barry Butler, Jack Charity, David Knight, Jimi Lindgren, and Darrell Rhyne. Chris Jay, Shreveport, a photo by trudeau on Flickr. A free seminar on social media, 9 a.m.-1 p.m., Mon, Nov. 18, at the Hilton Garden Inn/Homewood Suites by Hilton in Bossier City, will be offered by Chris Jay for The Shreveport-Bossier Convention and Tourist Bureau, in partnership with the Shreveport-Bossier Attractions Association. Entitled “New Tools and Techniques for Social Media,” the seminar will address such topics as building and launching Facebook ads, using social media “dashboards” to plan and organize marketing efforts, and more. This seminar is free to attend for businesses, organizations and individuals whose customer base includes tourists, travelers and other visitors to the area. Businesses who should consider attending the workshop include museums and other non-profit arts organizations, restaurants, hotels and motels, bed and breakfasts, transportation providers, artists and musicians. Lunch will be provided. RSVP is required by 12 p.m., Friday, Nov. 15. To RSVP, visit https://sbaaq4.eventbrite.com/ or call (318) 222-9391. Seating is limited. Chris Jay, public relations and social media manager: (318) 429-0658. 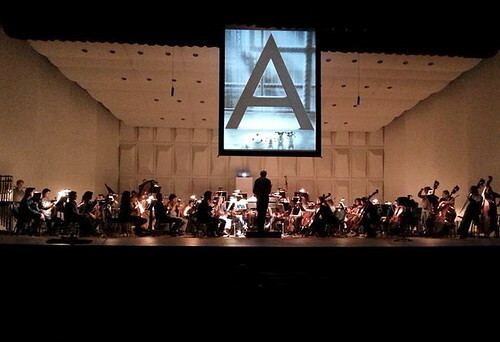 Shreveport Symphony Orchestra, a photo by SSO on Flickr. The Numberlys plus additional movie scores. 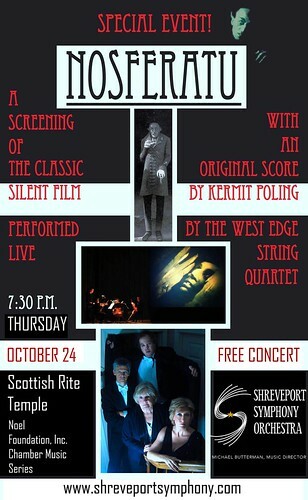 Tickets and more at shreveportsymphony.com. "You know what it is tomorrow right? The first Farmer's market of the fall. Come, enjoy the different colors, smells and else from the fresh produce at the market and of course some Breakfast/ Lunch with Us. 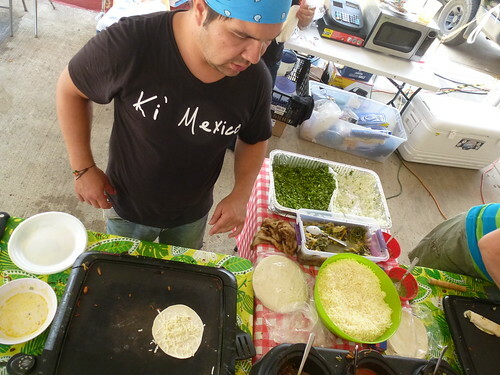 Fish Tacos as our special," says Rodrigo of Ki Mexico. Shreveport Farmers Fall Market on Saturdays from October 26 to November 23, from 8 a.m. to Noon. Both Pavilions of Festival Plaza, and the Market Cafe tent are full of great things to eat and explore. shoutout, a photo by trudeau on Flickr. Shout Out! 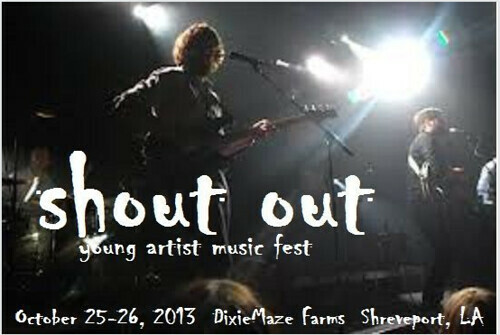 Young Artist Music Fest on Friday, Oct 25, from 6p-10p, and Saturday, 6p-9p, says Linda Walker Morse. - Participants can not be older than 20 years of age. - All music must be created live - no recordings of any kind. 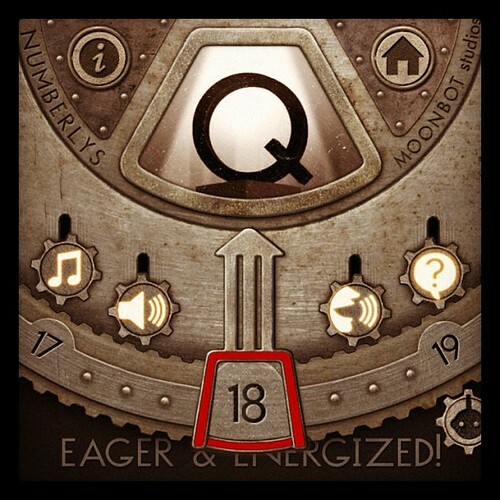 - Each set will consist of 15 mins. for setup/sound check and 15 mins. for performing. - 10 acts will perform Friday, Oct. 25th and 10 acts on Sat., 26th. - Independent judging will select "Best of Night" and "Best of Show". Best of Night winners will be invited to perform at DixieMaze Farms Halloween Night. Yoga Isadora Duncan, a photo by trudeau on Flickr. Downtown library yoga instructor Dorothy Kristin Hanna is a dancer, choreographer, Reiki certified, Feldenkreis Practicioner and Shamanic master. 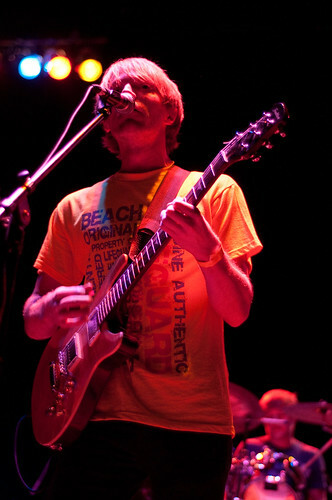 Images from Shayliff in concert, a photo by AHergenrader on Flickr. Shreveport Public Assembly and Recreation and the City of Shreveport want the Red River District to be the place to be on Friday nights,says Catherine Kennedy. Each Friday, you’re invited to come enjoy free music in the District from 8-10 pm. "The music is free, the camaraderie will be contagious and families with children are welcome," says Kennedy. - Platos de Mexicana will be available at Nicky’s Mexican Restaurant. - On Friday, October 25, the band is Shayliff. - Every Friday with the exception of Thanksgiving week. That date will be Wed, Nov. 27, 8-10 pm. West Edge Quartet, Shreveport, a photo by trudeau on Flickr. The cost of your tickets for Nosferatu / West Edge Quartet have been shined upon by the Noel Foundation. MSPS NMF Prelude, Shreveport, a photo by trudeau on Flickr. Shreveport Regional Arts Council on Monday, October 28, 5:30 p.m., says Casey Jones, hosts an Artists' Gathering at artspace. There will NOT be an Juried Roster Artist Meeting on Thursday, October 24. The gig on Mon is an open opportunity to "catch up" since the July Artists' Retreat. Learn what's unKnown about UsScene. Join in welcoming the new Roster Artists. Shout to all artists who are curious about the Roster, Ok? Talented Arts Program: Breakfast Club, a photo by trudeau on Flickr. The Caddo Parish Talented Arts Drama Program will present "The Breakfast Club" October 23rd - 26th in the Caddo Magnet High School Lecture Hall at 6:30 PM, says Denise Dion. $5.00 for public, $3.00 for students and teachers. Please donate a canned food item for the "Trick or Treat so kids can Eat" food program. Tom Sawyer: ACT @ East Bank, Oct 25, a photo by trudeau on Flickr. Please see more at ACT's FB page. Viva Lost Vegas, Artspace, a photo by trudeau on Flickr. Viva Lost Vegas, artspace's annual 'friend-raiser' Halloween party, is Friday, October 25 at 8 p.m, says Casey Jones. - artspace will transform into a lost city where the last of the population have become zombies. - endless buffet, specialty cocktails at the cash bar, Zombie Showgirls, an Elvis Wedding Chapel, a Vegas-style music performance from The Good News, 'Scare-e-o-kee' and more! "What happens in Lost Vegas, stays in Lost Vegas!" Unless it's in Shreveport. 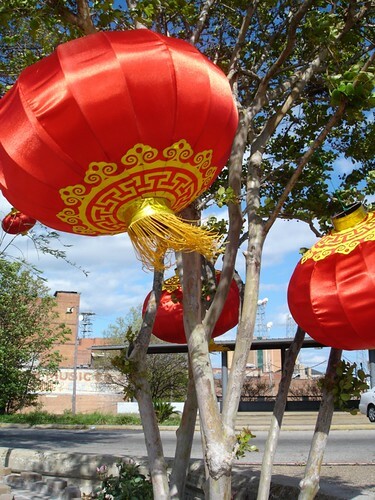 2nd Annual Aseana Autumn Festival on Sat, Oct 26, Aseana Asian Gardens, downtown Shreveport, 4 pm to 9 pm: Lantern Festival and Night Market. 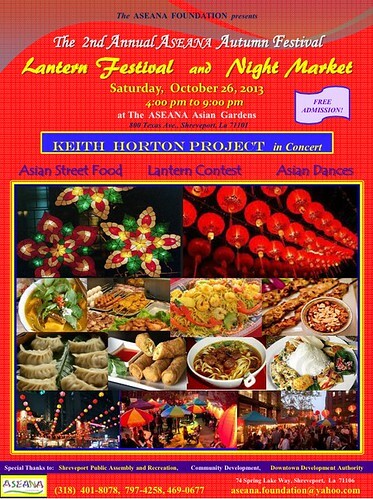 Keith Horton Project and Asian dances, Asian Street Food, a Night Market and a Lantern Contest. Lantern Festival guidelines. Email applications by Oct 19, 5 pm. One of many how-to videos. 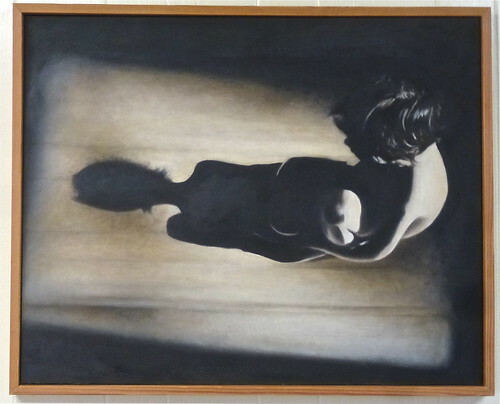 Steven Soffer talks about art 4, a photo by Kathryn Usher on Flickr. 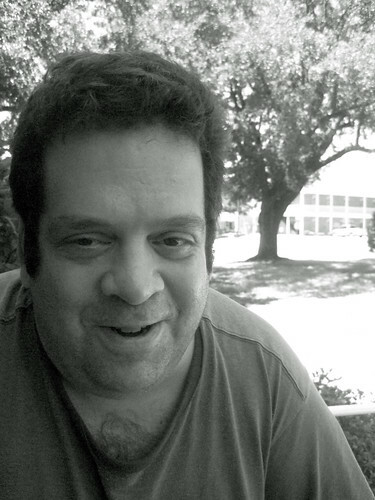 Philadelphia-educated artist Steven Louis Soffer was active as an artist and art instructor in Shreveport for some 15 years. He died on October 14, 2013, says his Times obituary. 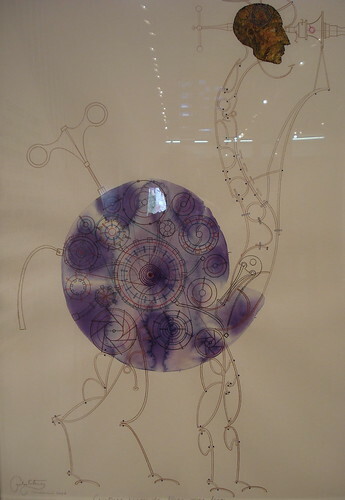 A graduate of Arcadia University in Glenside, PA, he worked in paint and ceramics. He also had a considerable independent edge to his work and discussions of art. In his artist statement at the NW La Artists Directory he said of his clay sculpture, "It’s as if I am connecting pieces of a cosmic puzzle; one part artist, scientist, philosopher, mathematician, together, and seeing where the journey takes me." 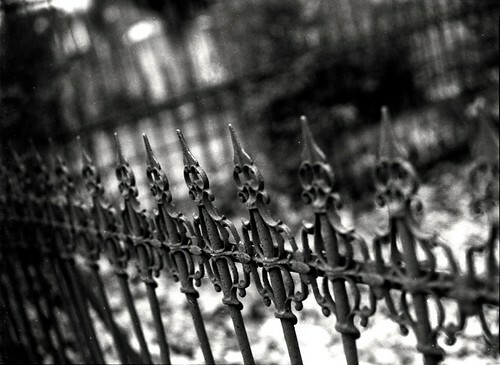 Wrought Iron Fence, a photo by Steve Snodgrass on Flickr. Celebrate the newly reconstructed Oakland Cemetery, Shreveport's oldest cemetery and historic landmark, with Live Music from "Airheart" and also "The Prevailing Winds," artists creating new works of art, Jerry Davenport teaching children's art activities, historic tours by "Yesterday's Lady" and you may even meet some current residents. Travel back in time to the 1800's to a simpler life...Bring a picnic lunch and throw out a blanket on a grassy hill, while you relax under the shade of a tree or bask in the sun. Enjoy a Sunday in the park. Cost is a suggested $5 donation for adults, children are free. Individual Picnic Boxes can be purchased in advance on this site and will be prepared by Wine Country Restaurant. Pick up your lunch when you arrive at the cemetery. Review: Songster Buddy Flett throws down an intense new album: "Rough Edges"
Buddy Flett: "Rough Edges" CD, a photo by trudeau on Flickr. A moaner, a shouter, a storyteller, a string slinger: that's Buddy Flett on his second solo song collection, "Rough Edges." Not a servile imitator of Delta blues musicians, yet a bluesman by the emotion in his stark singing and playing, singer-songwriter Flett has a distinct personality, a package of skills and traits that we call a voice. I have a strong feeling that erstwhile blues singer Jack White would respect and dig Flett. Flett's voice reminds me of an armadillo who's twisting and turning in his burrow, trying to get comfortable and get some shut eye. The textures in his singing are being contorted constantly; Flett and his throat box do not find rest easily. Nothing's fancy about Flett. Chrome slide on an old Gibson, straight through a small Fender amp. He also pumps a kick drum to mark time and add a simple bottom to his solo show. The sound is raw as a bleeding steak. If you caught him in the 80's playing jazzy lines on a red ES-335 in the successful regional rock and blues band called A Train you would have seen a different phase of his life. Today he has dropped self-conscious coolness for evocation of his grief. And your grief, too. My favorite cuts are "Third house on the left," "Dance for me," and "Nothing easy." It should be noted that Flett writes most of his songs and has won success by writing songs with friend David Egan. Their songs have been recorded by John Mayall, Kenny Wayne Shepherd, Percy Sledge and Tab Benoit. Flett closes the album with a Lead Belly tune, "Bring me a li'l water, Sylvie." There are a lot of similarities between the 2 men, both raised in Caddo Parish, Louisiana. Huddie Ledbetter, aka Lead Belly, was more than a bluesman. He was a songster, or a man who could do it all. 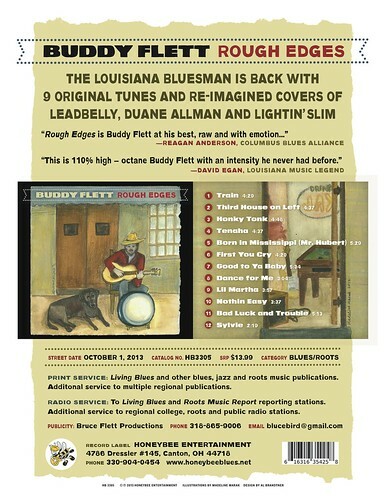 So is the latter day Caddo basher and slasher who's made "Rough Edges," Buddy Flett. Dia de los Muertos Shreveport, a photo by trudeau on Flickr. 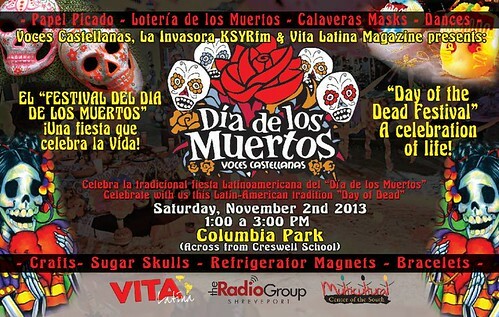 Art, crafts, games, candies, folk dances, music and altars -- and free admission, says Lee Spruell. 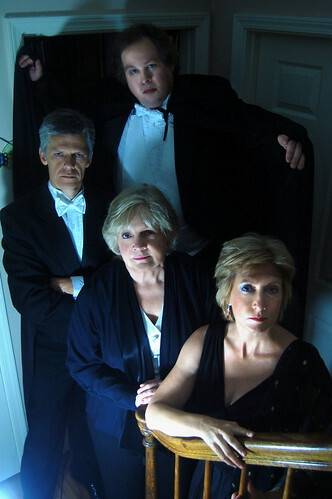 West Edge Quartet, Shreveport: music for Nosferatu on Oct 24, a photo by trudeau on Flickr. A classic movie with soundtrack performed live in the sumptuous Scottish Rite Temple. Admission underwritten by the Noel Foundation. UnScene agenda, Shreveport, a photo by trudeau on Flickr. If you went to UnScene One, the prelude to the MSPS New Music Festival, you saw a dynamite confabulation of architecture, lights, sound and artists. Be a part of it. UnScene unfolds its wings in the Shreveport Common area once a month. 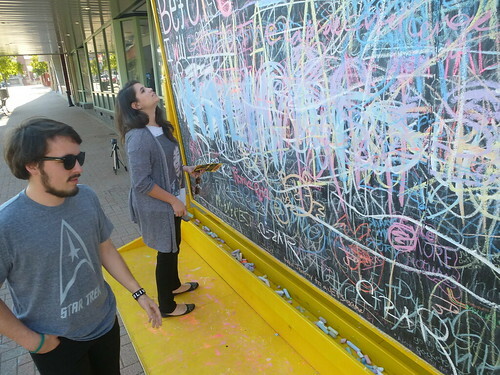 Megan Davis Bucketlist Blackboard, Texas St, Shreveport, a photo by trudeau on Flickr. The Bucket List Blackboard above is a project by Megan Davis of Plain Dealing. Construction was supported by a grant from Shreveport Regional Arts Council. Red River Radio, also a blackboard, if a sophisticated one, will serve a lot more people and do it all year long, all day and all night. Yet there are not enough subsidies to keep this public radio station on the air without donations. As a donor, allow me to testify that it feels good to support this outstanding radio service. Tomorrow I will be one of many community supporters of KDAQ talking to you about how to make donations. Somehow we will gather enough money to keep her going. Across the nation, across much of the world, public radio is being supported by people like you and me. It's a healthy situation, even in that it takes a bit of sacrifice to do the right thing. Please listen and pledge. Here's more info. MSPS prelude, Fri, Oct 11, 7 pm, Crockett at Common St., a photo by trudeau on Flickr. Have been told that avant rag musician Pete Fetterman, he of the flaming balls of gasoline roaring from his mouth, is planning to present a recording of his cutting, spicing and searing of a 3-course supper. Then his audience will listen to a recording of the consumption of said supper. That's at 8 pm. 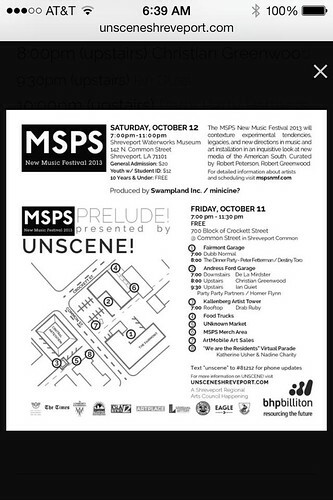 And there's much more at the UnScene prelude to the MSPS Festival. 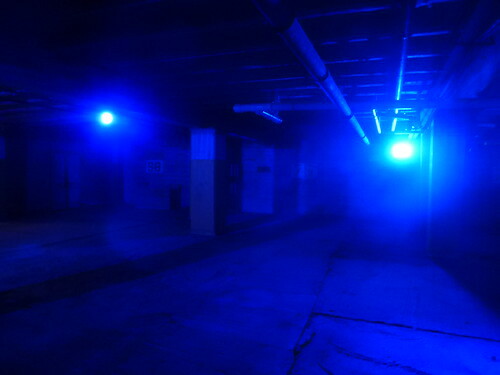 The actual MSPSNMF takes place at the Shreveport Waterworks, 142 N Common St, on Sat night. Both urbane, experimental and unUsual evenings highly recommended. DSC06136, a photo by revjdevans on Flickr. 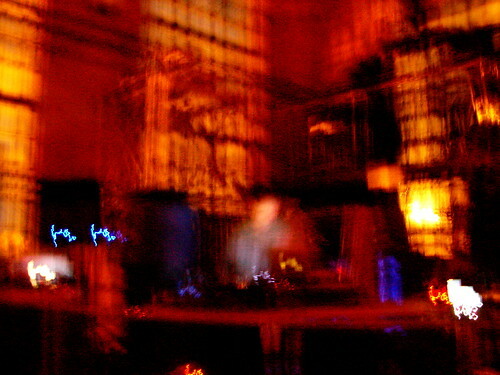 The McNeil St Pumping Station New Music Festival featured electromatrician Tim Hecker in the 2011 fest. His work whacked the rafters. Hecker's work was released on MSPSNMF 2011: Architectural Explorations in Sound. This week Hecker has released a majestic new work. Hear it on Npr.org. And the MSPS Fest has a whole new sound. This year expect jazz (Kidd Jordan, Dickie Landry, etc) and beats (de la Mirdster, etc) as well as sonic cross-peninsula portages (Pete Fetterman). Atmospheric field recordings, on-site trilobyte art from the cedars and iron particles of this city, will be presented by global recordist Simon Whetham. The Bristol, UK-based musician will present his explorations of Shreveport's molecular structure on Sat, Oct 12, at the site, today called Shreveport Waterworks Museum (142 N Common St). Tickets for a Mr Kite bill of avant garde musicians and a metasmagoric evening are $20. The Shreveport Symphony Orchestra partners with Moonbot studios to present the Bots' animated short, "The Numberlys." It will be screened with a live orchestral score - a newly commissioned composition - on Sat, Oct 26, 7:30 pm, says Lois Robinson. "The Numberlys" will be paired with a screening of the classic film "Metropolis" with orchestral accompaniment. "And on Thurs, Oct 24, as part of the Noel Foundation, Inc Chamber Music series, we will present the silent classic "Nosferatu" with a live musical accompaniment of music composed by Kermit Poling for the West Edge String Quartet. This concert will take place at the atmospheric Scottish Rite Temple. It will feature the newly restored theater pipe organ," adds Robinson. The Nosferatu concert is free and open to the public. Kandi Kane session for Ashley Hazelton art exhibit, Shreveport, a photo by trudeau on Flickr. "Shreveport is looking for artists from many different media for a monthly event! Deadlines are specific to each month. 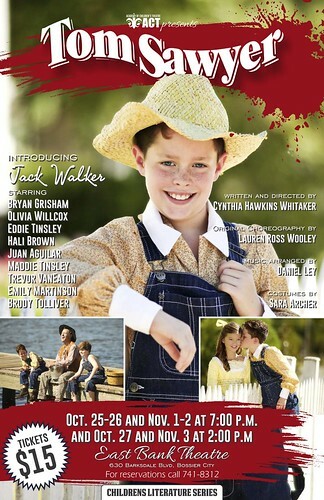 Please view the pdf for specifics," says Casey Jones. "Each UnScene experience will be UnLike any festival “scene” in Louisiana: 12 monthly, multidisciplined, pre-meditated but improvisational day-through-night Saturdays will feature transformational interactive arts activities. Examples of these activities include public art Installations, films projected in and on the buildings, exhibitions in UnExpected spaces, spoken word on stoops, theatre in the air, dance in the garden, giant puppet theatre in the alley, a juried street arts market, innovative scavenger hunts and walking, biking, and float parades. 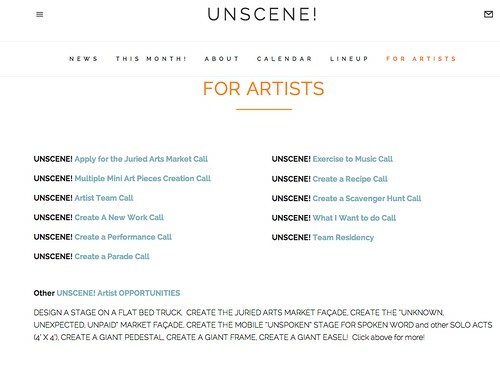 For the multitude of Artist calls and Artist Opportunities, please visit unsceneshreveport.com/artistcalls." 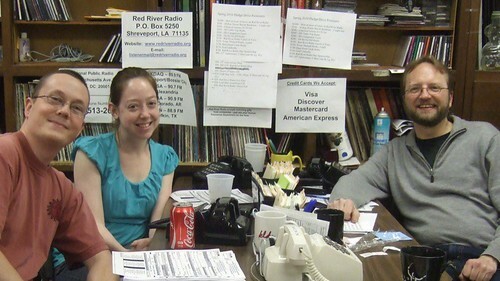 Red River Radio pledge drive, Shreveport , a photo by trudeau on Flickr. 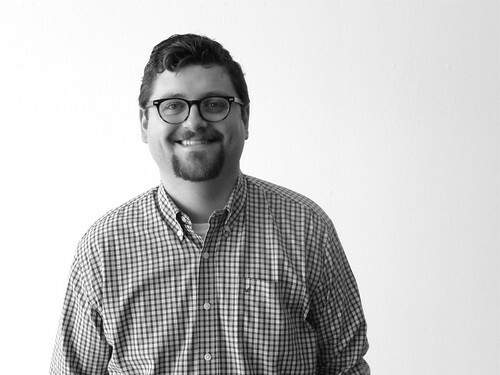 "Here at Red River Radio our goal is to provide more programming and less on-air fundraising," says Henry Edwards. "We start our fall pledge drive Oct 14, and we are asking you to help delay or even eliminate the drive by pledging now. For every $20,000 raised, Red River Radio will shorten the drive by one day. Get in on the drawing for this Ipad Mini by pledging before midnight on Cyberday, which is Friday, Oct 11. In February we asked for $20,000 by Cyberday and you gave us $22,000. We were able to take a day off, giving our listeners a break from lengthy pitching. Cyberday is Oct 11. You know what to do. Pledge now and you'll be entered in all the Fall drive contests. Pledge @ redriverradio.org or call 800-552-8502 during business hours." Aseana Night Market, 4 pm to 9 pm, Oct 26, Shreveport, a photo by trudeau on Flickr. Crunchy, hot, oily, salty and intensely-flavored street food served on a lantern-lit night with music and hubbub all around you. So it goes at an Asian night market. In keeping with a global trend, the Aseana Foundation will present a local version of the night market at Asian Gardens, corner of Line/Common and Texas Ave, on Sat, Oct 26, 4 pm to 9 pm. 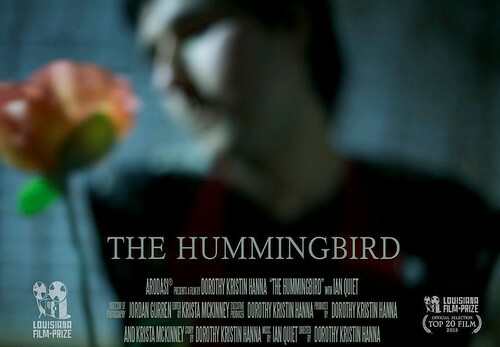 The Hummingbird film, Shreveport, a photo by trudeau on Flickr. Using the fine arts as an economic engine is not a bad idea. After, it's part of the business life of cities like NYC, Chicago, Los Angeles. Gregory Kallenberg, his team and numerous supporters, are trying to expand the film side of Shreveport business activity via Lafilmprize.com. This week, Oct 3 - 6, offers locals and visitors an opportunity to have fun by attending the movies offered by the hard-working LFP. Expect a good bit of downtown hypery as the filmmakers of the top 20 films try to grab your attention during the weekend. If you feel a connection to them and like their movie, you'll vote for it. The viewer's vote is 50% of winning the $50,000 prize. Watching two films from last year might be helpful in sizing up what to expect this year. Phillip Jordan brooks, writer-director and actor ("Night of the Iguana," River City Rep) has "Ruby and the Dragon" this year. Last year he came within an ace of winning the prize with his noirish thriller, "This is a microphone." Evan Falbaum, writer and director, has a film called "Clowns and Robbers" this year. Last year he made the top twenty with a thought-provoking tale, "The Human Experience." Sun, Oct 6, Shreveport, a photo by trudeau on Flickr. Eight venues featuring 24 artists, three bands, hands-on demonstrations, food and drink will be open throughout the Highland neighborhood Cultural District on Sun, Oct 6, says Liz Swaine. The event is Free and allows tours into the homes and work spaces of Highland artists as well as the opportunity to see art being created. One-of-a-kind artworks will be available for purchase at each location. The 10 am- 3 pm event begins at 436 Topeka Street (across from Highland Park) at the workshop of artists Su Stella and Curt Harville, where maps of all locations on the tour will be available. 436 Topeka St.- Su Stella and Curt Harville- glass & iron items, blacksmithing & art demonstrations. EcoPsychArt wreaths & wood art by Pam Viviano McDonald, original art by Kathryn Usher, Pronto Puppy & dog items by Kerstie Harville. 2011 Highland Ave.- Live music by Twang Darkly, Laura D’Arcangelo- handmade jewelry, Simply Divine Jewelry & Boutique Pop-Up Shop, Tammy & Steve Zhilavsky- mixed media art and sculpture. 1173 Louisiana Ave.- Blue Southern Comfort Foods hamburgers & drinks. Live music by Alexandra McCullough, Lynn Laird- scrimshaw & custom gun grips, photography & fine art, scrimshaw demonstrations. Marijo Brown- recycled, repurposed & upcycled art, Keli McKenzie-Brown- , Aliya Rafikova- color drawings & etchings. 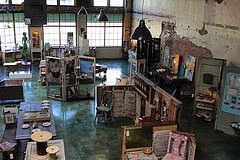 118 East Jordan St.- Carrie and Jeornie Journell- orginal paintings & prints, mixed-media objects. 1536 Stephens St.- Myron Griffing Open House- art, interior decor, furnishings for sale. Brett Malone- original paintings. 829 Kirby St.- Wendy Tisdale original jewelry, painted furniture, digital art prints. Dorothy Kristen Hanna art for sale. Jay Marks- wire sculpture. Live Music by Leonard Service & The Pickers. Massage raffle tickets for sale (proceeds donated to Highland’s own Robinson’s Rescue low cost spay & neuter clinic). 424 Dalzell St.- Karen LaBeau- expressionism paintings. Marci Gatlin-Hicks- brightly colored prints & notecards, some original works, prints for adults & kids to color and take home, water and lemonade for sale. 444 Olive St.- Olive Street Thrift Shop- Remember that a portion of sales go to support animal welfare causes. 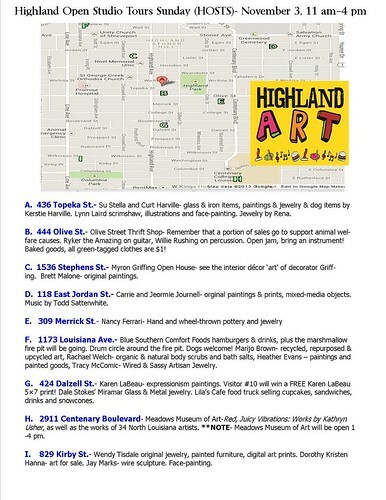 The Highland neighborhood is Caddo-Bossier’s only state- approved neighborhood Cultural District (the other cultural district is located in Downtown Shreveport) and means that no sales tax is owed on one-of-a-kind works of art. Jacquelyn's, La Ave, Shreveport, a photo by trudeau on Flickr. Jimmy and Jackie Caskey are quiet about their success. They are quietly well-read, well-traveled and hard-working people. 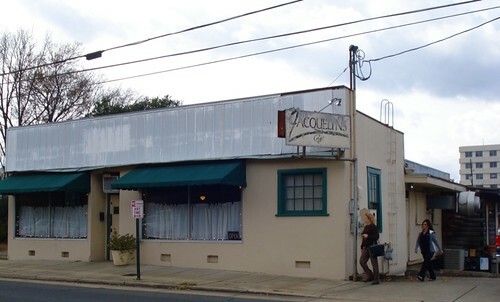 They let their gumbo and etouffee do the talking for them at Jacquelyn's Restaurant, Louisiana Ave.
On any list of the best in Shreveport-Bossier and the best in the Bayou State, the food at Jacquelyn's Restaurant must be given the highest regard. This week Chris Jay, blogger at 20X49 with a widely-traveled appreciation for Louisiana cooking, wrote an appreciation for Jacquelyn's. Both the restaurant and the blog are highly recommended. Jeremiah James: Bus Stop, RCRT, a photo by RCRT on Flickr. Tickets are on sale for River City Rep's eighth season opener, Bus Stop, says Patric McWilliams. In the middle of a howling snowstorm, a bus out of Kansas City, headed for Montana, pulls up at an isolated roadside diner. The highway is blocked in all directions and the weary travelers are going to have to hole up until morning. 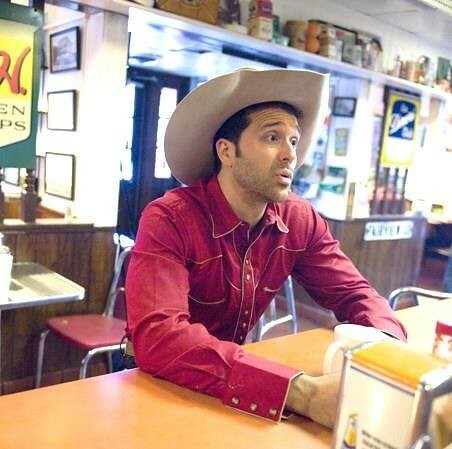 On board is an innocent cowboy who has met the girl of his dreams and has forced her onto the bus to make her his wife. This production of Bus Stop marks the centennial of William Inge, the playwright who wrote Picnic, Dark At The Top Of The Stairs, and Come Back, Little Sheba. The 1956 movie version of Bus Stop starred Marilyn Monroe. Bus Stop plays Oct 9 - 13 at East Bank Theatre. Reservations, 318-868-5888. Tickets are $35.